“Do you want it in the belly or in the teeth?” –my father, to a would-be robber, who suddenly remembered a previous appointment. My dad’s eyesight was pretty bad by then, so he couldn’t aim at the eye. However, the teeth remained a viable aiming point for him. At age 83, he and I took the training to get our Nevada Concealed Handgun Permits. He outshot everyone in the class except me. One reason was he knew to aim at something. One of the biggest problems I see in current training methods is the concept of “aim for center of mass.” Coupled with the blank targets used, it’s no wonder that people have a hard time learning to hit anything. That’s the equivalent of what’s called an “area target” in the Army. Area targets are best engaged with some form of area weapon, such as a machinegun, grenade launcher, mortar, or artillery. However, we don’t carry area weapons for self-defense. One of the greatest handgun shooters ever, Ed McGivern, was asked how he could hit playing cards so quickly and with such tight groups. His answer was “I’m not aiming at the card, I’m aiming at a spot on it.” Ed established some speed records that have never been broken, so this is does not have to be a slow process, either. The idea that aiming at a spot on a target is too slow is a common misconception. It does require practice, though. To facilitate this when I am dryfiring, I have targets with spots on them. The one I am using now has a variety of spots on it. There is a face, a cut out area of the IDPA -0 zone with a spot in it, and a series of circle and dots on the back. 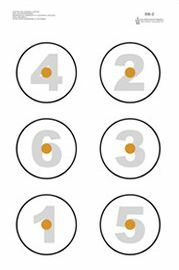 When I’m shooting IDPA, I do my best to pick out a spot on the target to aim at, such as a paster or group of pasters. So, I’m not aiming at ‘center of mass,’ I’m aiming at a spot. When I explain this concept to students in my Defensive Pistol classes, I reference the Internet meme “Be polite, be professional, but have a plan to kill everyone you meet.” Whenever I hear that meme, I ask “What are the elements of your plan?” I have yet to receive any meaningful response; it’s just a platitude that people repeat to sound like they’re ‘switched on.’ I tell my students that one element of my plan is that as soon as I meet someone, I pick out the spot on their body that I am going to aim at, should it become necessary to shoot them. Then I describe to each person in the class what the aiming point for them would be. This tends to generate considerable discomfort but makes the point very clear. Most of the class is shot on dot targets. Only when the students shoot the qualification course do they shoot at a silhouette, which has a discernible aiming spot on it. Spot shooting is a fundamental part of the instruction at the elite Rogers Shooting School. There is always a spot on the body plates at the School. When practicing recoil control via the ‘Bill Drill,’ aiming at that spot is key to firing a good group. What we are trying to achieve when aiming at a spot is not necessarily to hit the spot but rather to get our bullet very close to it. As I explain to my students, our groups are always going to be larger than what we are aiming at. This is true because guns are not generally capable of putting all the bullets in the same hole, nor are we Terminators who can hold and press the trigger exactly the same way every time. However, by aiming precisely, we minimize the amount of error induced by mechanical tolerances and our human fallibilities. This is the fundamental problem with ‘aiming at center of mass.’ In that philosophy, the entire silhouette is the target. So if the group is larger than the target, misses become an inevitable part of the result. Throw in poor trigger manipulation and you end up with a 20% hit rate. Try this out the next time you go to the range, I think you will notice a difference. To be entirely fair, some targets have a good aiming point on them, and some don’t. 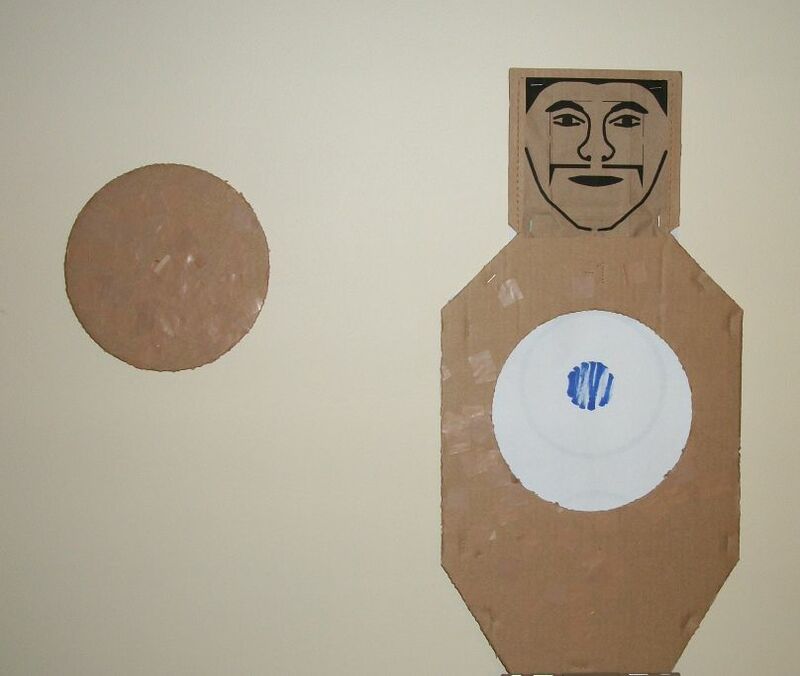 IPSC and IDPA use big blank cardboard targets with scoring rings that are very difficult to see. On the other hand, if you use a B27 silhouette target, you can see the printed X in the center of the X-ring without any great difficulty out past ten meters, maybe further if the lighting is good. I sometimes use a felt-tipped pen to make a mark on the target to serve as an aiming point. I have been doing this mental exercise for a while now and I am mentally computing firing solutions, so to speak, using the guidelines taught to the US Air Marshals’ Service. That is, the point of aim is the intersection of a more or less horizontal line between the armpits and a more or less vertical line running from the head down through the center of the torso; from the front this coincides pretty closely with the upper portion of the sternum, which has the heart directly behind it. For example, on the old Metropolitan Police “squinting thug” target, the point of aim is the center of the gap between the target’s right hand and the bottom of the chin. Some great points here. We elected to make our standard moving target surface 6″ in part because we felt that it gets you to tighten in on that focal point.